Three most beautiful Basilicas of Rome, absolutely to visit! Three most beautiful Basilicas of Rome, absolutely to vist! After a nice walk through the most evocative fountains of the capital, it’s time to enter the three most beautiful basilicas of Rome, absolutely worth visiting. Put aside your religious belief, if you have one and let yourself be carried away by the uncontrollable beauty of these places of worship, do not do it would certainly make you sinners. One of the many drawbacks of the “average tourist” (me in particular) is to have little time available. It will be enough for you to dedicate only half an hour of your time to live an experience that will make you discover even the most hidden beauties. You are ready? 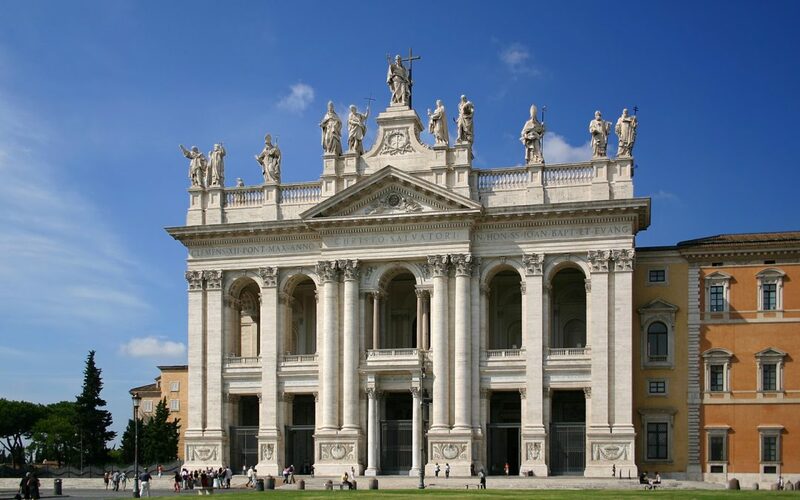 The first stage of our walk on the three Basilicas of Rome is Archbasilica of St. John Lateran. Absolutely to visit! The phases of the construction of the basilica were many and range from the medieval period up to the Baroque age. Before Pope Innocent III entrusted its work to Borromini, the Arch basilica of St. John Lateran over the centuries was constantly enriched by works of art and monuments including the famous fresco by Pope Boniface VIII made by Giotto, in which the Pope is depicted in the act of proclaiming the first Jubilee of 1300. Thanks probably to the covering of pre-existing columns with pillars, Borromini managed to recreate a particular acoustic effect. Incredibly, in fact, if you lean against the colonnade between arches, you can talk to the interlocutor in front of you, leaning against the opposite colonnade, and no one would hear anything. It is incredible to explain, but those who have been there will be able to confirm that the feeling of smallness in such a church is indescribable! The huge statues of Borromini give a rhythm to the main nave. In the final part of the central aisle the completely frescoed tabernacle opens before us, and right here behind a grate are the relics of the apostles Peter and Paul. The beauty of the Basilica of Arch basilica of St. John Lateran also continues outside. At the back of the church, going out in the open air, a beautiful cloister comes to life. This is all that remains of the ancient monastic complex and with its 36 meters of height is to be considered among the highest in all of Rome! Continuing for a little more than a kilometre on via Merulana, we are going to meet the second of the three most beautiful basilicas of Rome to visit: the Basilica of Saint Mary Major. If you happen to be in Rome the first week of August, go and visit it on 5. Do you want to know why? According to the legend, Giovanni had no children. He decided to dedicate a church to the Virgin Mary appeared to them in a dream on the night between 4 and 5 August 352 AD. Our Lady had informed them that a miracle would show them where to build the church. Even the pontiff Liberius had the same dream and the next day, he went to the Esquiline and found it covered with snow. Precisely in memory of this miraculous event, still today on August 5, white petals are released into the air, which produce a truly evocative effect. Often underestimated but really interesting is the museum of the Basilica. Here in fact is preserved the “Holy Crib”, a priceless relic! 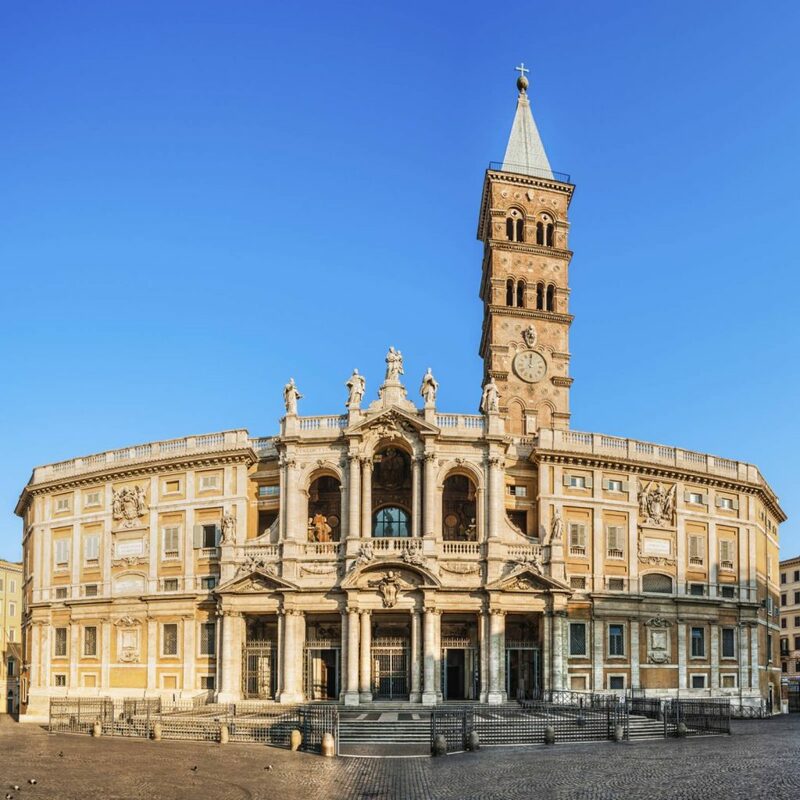 It would be the most precious object for the Marian cult, which contributed to making the Basilica of Santa Maria Maggiore an unmissable church! 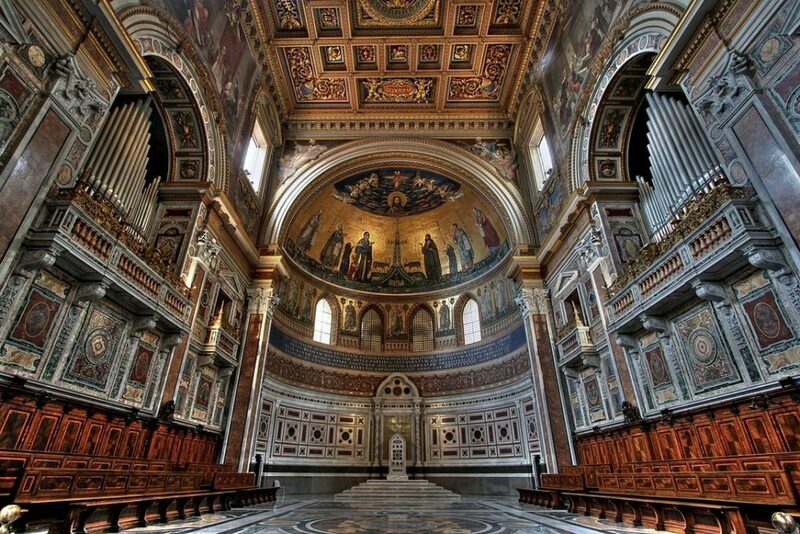 Just a minute away we find the last of our three most beautiful basilicas of Rome, absolutely not to be missed: the Basilica of Saint Praxedes. This beautiful basilica, located in the Monti district, a few steps from the Basilica of Saint Mary Major, preserves another object characterized by a strong historical as well as clearly religious value: the scourging at the Pillar. In a niche to the right of the entrance there is a column brought to Rome from Jerusalem by Cardinal Giovanni Colonna in 1223. In a niche to the right of the entrance there is a column brought to Rome from Jerusalem by Cardinal Giovanni Colonna in 1223. According to tradition it would be the column to which Jesus was bound to undergo the scourging. The hypotheses about the authenticity of this object, as you can imagine, are many and make the Basilica of Saint Praxedes one of the most evocative places of worship. 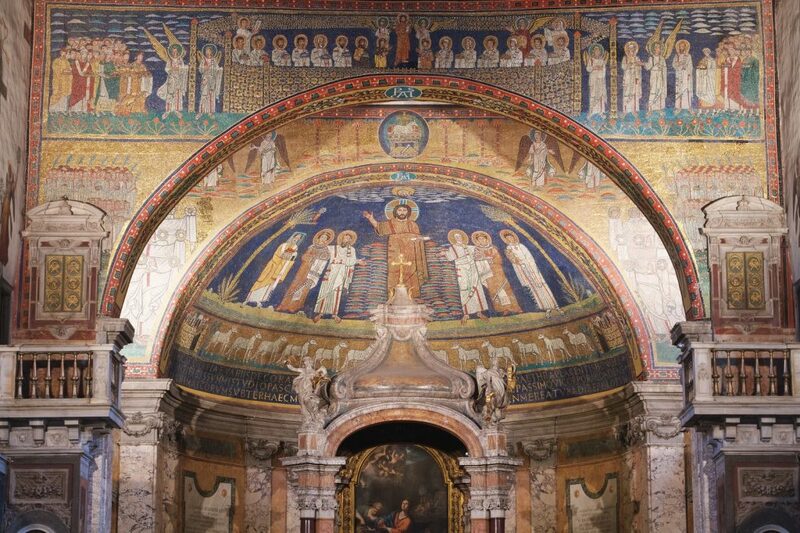 Another element of the basilica that literally dazzles are the mosaics. These mosaic works have no comparison with any other masterpiece of the Roman Middle Ages. Their chromatic fantasy, the complexity and richness of the symbols give to them an inestimable artistic value. After having told you a bit of history, it would be a shame to march towards these beautiful basilicas and then find them closed. Here are the times when you can visit them: the Archbasilica of St. John Lateran and Basilica of Saint Mary Major are open to the public with a continuous schedule from 7:00 to 18:30, the church of Basilica of Saint Praxedes opens from 7:00 to 12: 00 and from 16:00 to 18:00. There are a thousand good reasons to enter a church; we have only suggested a few. If you prefer to be accompanied by an expert guide, consider to book a private guided tour in advance and enjoy your visit!